Sensei is often used to address a teacher in a Japanese martial arts setting. Earl and Sedor Photographers John Sedor and JB Earl recently were shooting images for the Wilkes University Magazine. 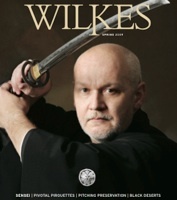 The subject, Carl Long, is the highest ranked member of his type of swordsmanship in the world and is the senior-most student under grandmaster Masayuki Shimabukuro. We guess the Greater Wilkes-Barre area is a little safer at night with Carl around! It was an especially fun shoot for photographer JB Earl because he also studies the martial arts.